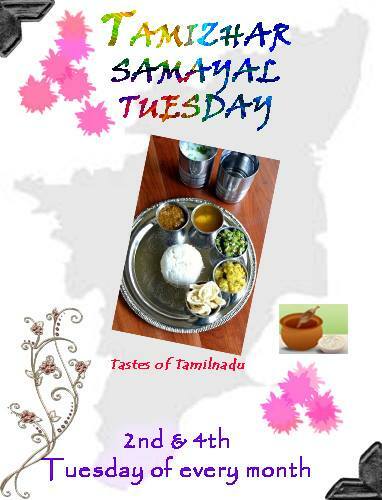 We group of friends started a new event Tamizhar Samayal Tuesday which is going to happen in 2nd and 4th Tuesday of every month. Tamilnadu cuisine is famous for its flavor and spices,each district has their own signature recipes.We know very well that Tamilians have many delicious foods, for example Kanchipuram is famous for idlis, while Tirunelveli is famous for halwa, needless to say much about the famous Chettinad cuisine and another well known is Kongu cuisine. Yes we are proud to be Tamilians and we love to share our knowledge of this famous foods, thus we planned this event.In this event you can cook and show case the food which is very popular and traditional in any region of Tamilnadu.Both veg and non-veg recipes are allowed. This event doesn't have any specific themes or ingredients,cook anything popular in the region of Tamilnadu.The main motto of the event is to know the food cultures followed in each region especially in village sides. appreciates u all first..hw dedicative u all r on blogging..gud..all d best. count me in dear...lovely !!! Love to be a part of it..